1. Lentils. Lentils have many things, nutritional and culinary and historical, to recommend them, but the very first time I succumbed to their charms was in the very very very old school Campbell's Vegetable Bean soup. This was back in the day when children could come home for lunch, which I did. It was so choice, because that meant you could eat the things that you adored, if your mother was inclined to make them for you, which mine was, at least as I remembered it. Anyway: Cambell's Vegetable Bean soup had all the vegetables, Campbell's soup-wise, and all the beans. I loved them, each and every one of the beans, but most of all I loved the lentils, which I did not know, at the time, was their classification. Their bean genre, as it were. "Aren't these little? and cute?" is what I remember saying to myself. Also, there is a Biblical element to my adoration of the lentil: when Esau sold his birthright to Isaac for a mess of pottage, which any Bible dictionary, or at least the one in my childhood Bible (white leather binding, tiny cross on the zipper), will tell you is lentils. That's right: Esau was so dang hungry, he sold his birthright for lentils. Today, I had lunch with a friend at a mezze restaurant. She ordered kushari (me: fattoush, of course, and also fries, because they had signature fries, and who doesn't want to try fried potatoes that are so special they are signed?). Kushari is, and I quote, "a traditional Egyptian-Pharoic dish made of rice and brown lentils layered with elbow noodles, carmelized onions, and topped with a tangy mild tomato sauce." I had a taste of it and it was the food of the earth, food that would sustain you through millennia and more. Ergo, I came home and took all the vegetables out of the vegetable drawer, and also my little stash of green lentils. Green lentils are French lentils. They are, therefore, slightly suave, and luckily they also cook just a little more quickly than brown lentils. The ensuing soup was delicious and sustaining. "Do you want to know how I made it?" I asked the historian. His patience is truly epic. I commenced: "I had one half onion sort of rolling around in the refrigerator. I had some celery. I had some celery root--that was that thing in little slices?" (gesturing in the manner of thin little slices:) "also carrots and a red pepper and a jalapeño. I sautéed all of that in olive oil." The smell of all of that sautéing in olive oil. Starting with the onions, then the celery, then the celery root, which is a knotted, gnarled little thing, but so lovely sautéed then simmered. Then the carrots and the celery. Then the peppers. I sautéed and then I sweated them. "Then I added broth"--which was, to be honest, vegetarian bouillon cubes and water, a culinary shortcut by which I swear--"and about three quarters of a cup of lentils. And then." --and then it was soup. I meant also to chop a little flat-leaf parsley for a garnish, but I forgot. However, on a February night, the lentils were, just as they were when I was ten, little, and cute, and also suave and sustaining. And also delicious, definitely delicious. I love lentils and now I love them even a little more! Lentils! One of the enrichment learning activities for my food-themed composition class is trying out a recipe for lentils, tasting what you've created, and writing about the experience. 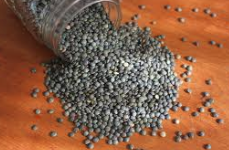 So many college students know nothing of lentils, a wonderful and tasty--and cheap--source of nourishment. Do you mind if I show them your delicious post? I adore you and your suave lentils. Charlotte, I would be totally honored!